The first thing I did before creating the mag ad was research into the general format conventions, by de constructing a number of different genre adverts from the music magazines Kerrang and Q. 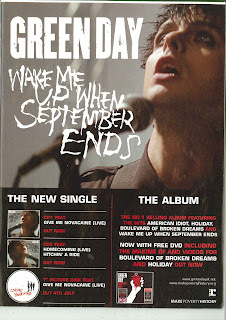 A few examples are Various adverts from Q, Green Day and 30 Seconds To Mars. We then looked briefly into a similar genre digipak (AC/DC), and found that there were a few differences for this genre of digipak, such as; very simple layout, not many images and darker colours. 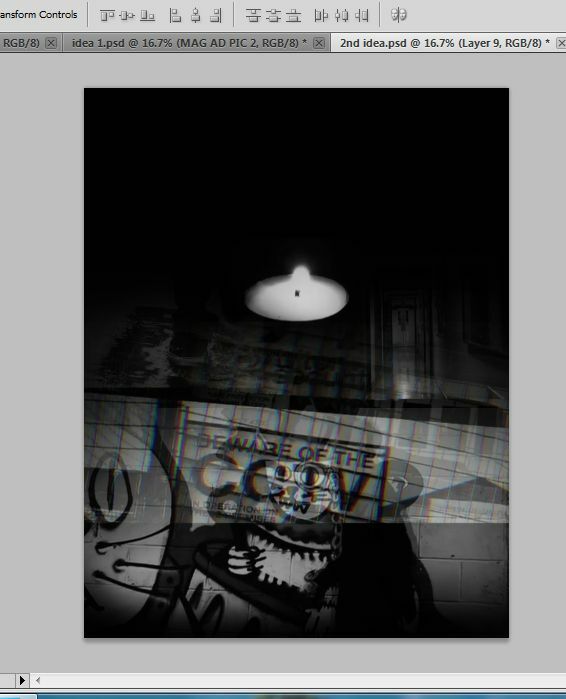 We then incorporated these codes and conventions into our own digipak. This is the final magazine advert, with the appropriate changes having been incorporated in relation to feedback. We now have a new deadline for the final cut, digipak and magazine advert; Monday 6th March. We are spending the lesson and free time today trying to get everything polished up and ready to hand in at 3:00. We are also putting together a vodcast, using images to present evidence of how we have used DCRP and MRGER. This is a vodcast discussing the research we all did into the industrial metal genre to see what we saw as codes and conventions and things that were recurrent themes in the world of industrial metal music video! Over the last few days I have been working on a new draft of our magazine advert, I started again with the same background, using the same images, but the layering is going a lot better this time around. 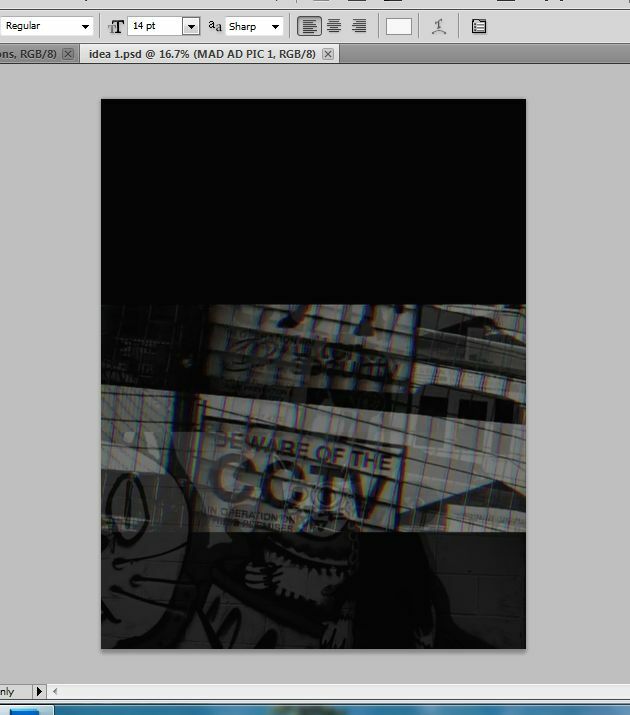 Hopefully it should be finished by tomorrow, and then I can ask for feedback/ improvements. 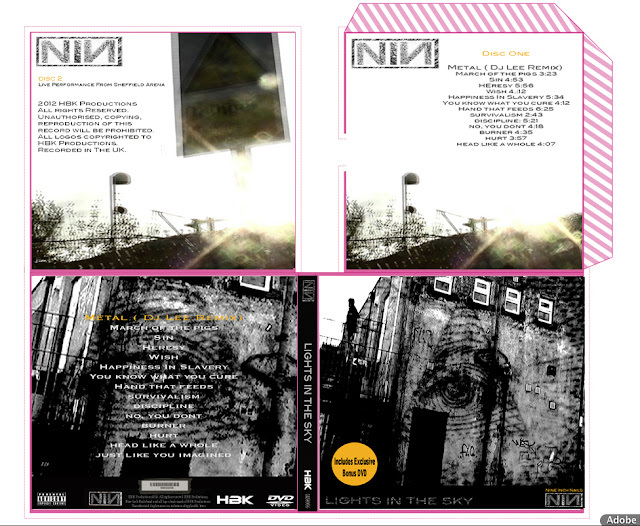 From the examples of Digipaks I have looked at you can see they are all of a similar sort of format though there are some difference between genre's as I have looked of examples from a range of genres and have also looked at digipaks for the metal/ industrial metal genre and seen different codes and conventions between them. 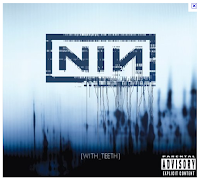 They usually have a cover photo which is known as the albumn artwork, sometimes this is just a plain image of the band for example the ignacio fernadez example I looked at, or can be a slighty more obscure cover image that is edited like the 18 till I die album. Though for examples of the metal/industrial genre I looked at were all more minimal and didn't have a glossy, eye catching cover photo but seemed to have colours like greys and browns for the AC/ DCand Dragon Tatoo examples these were just textured backgrounds which was very opposite toIgnacio Fernandez which had a very vibrant, clear and colourful photograph as its cover image. 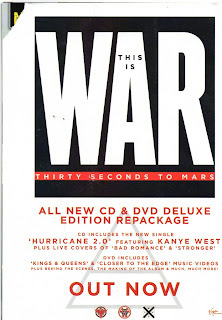 On the Front typically includes text saying the album and artist name. In a very large font that takes stands out from the rest of the cover. 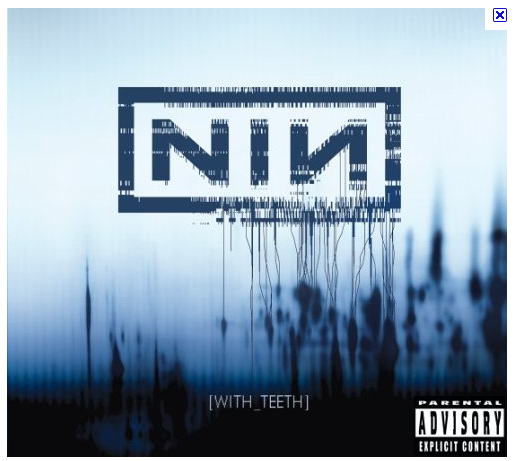 The band logo is usually included on the front cover this is seen largely in NIN digipaks with the NIN logo taking a large focus on the cover usually positioned in the middle of the cover this is the case with the nine inch nails album WITH_TEETH. 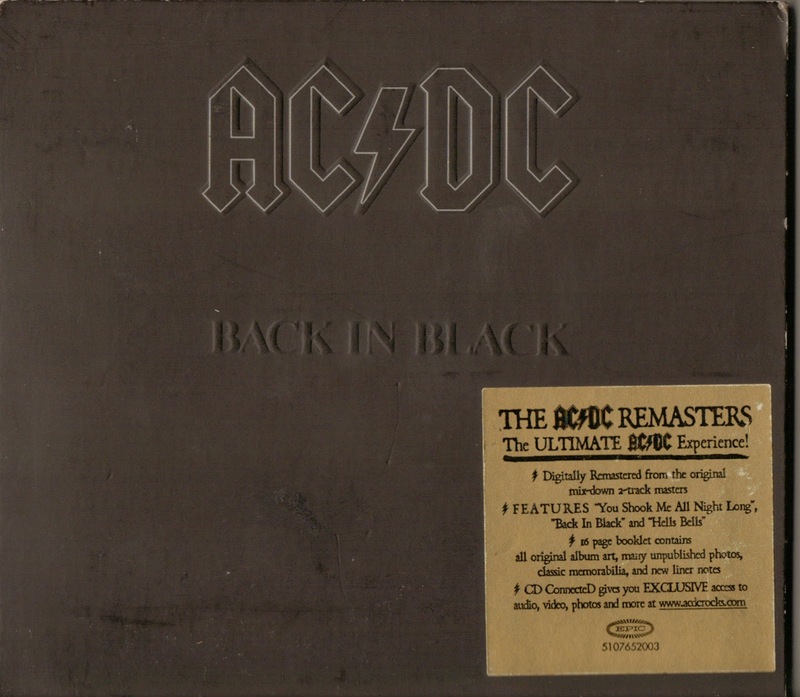 The sticker was a large focus on the AC/DC Back In Black album as the sticker in the bottom right of this cover almost took up a quarter of the front cover. 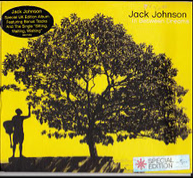 The use of stickers was also included on the cover for Jack Johnson's album. Which had a shiny 'Special Edition' sticker and a plain black oval shape that looks like a sticker but has actually been printed on the cover rather than a separate layer stuck on. A reacurrent feature I saw for the inner covers was the use of photographs of the band, this was seen in the AC/DC back in black album and also a digipak for Take That, these both included photographs of the band. They sometimes have some sort of connection to the image on the front cover this was shown in the NIN Pretty Hate Machine album, as the image on the inner panel was actually the same image as the front cover just edited differently and changed from a CU to an ECU. Back On the back I found from research that there is often correlation between the image on the front and on the back, like the photo on the front would be shot front on and the image on the back would be shot from behind. This was on pretty hate machine, the cover photo just edited differently. Ignacio Fernandez it had information on the tracks and how long they were. The backs always included copyright information, company logos/idents and usually the URL of two websites; The artists official website and the production company's website. Something that every single Digipak shared was that they all had bar codes located on the back. 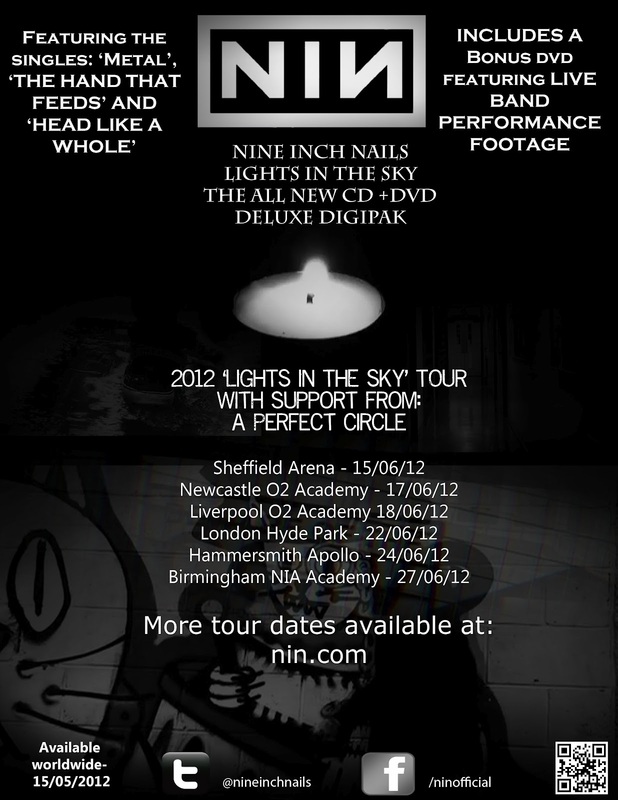 - Nine Inch Nails band name as well as the band logo, this is something I'm including in our magazine advert. I made a couple of changes after receiving feedback from the rest of the media group; I first swapped the full URLs of the social networking sites with icons, as this looks better and most people are familiar with these icons. I 'onion skinned' the icons on Adobe flash, and changed the colours before adding them to the ad. 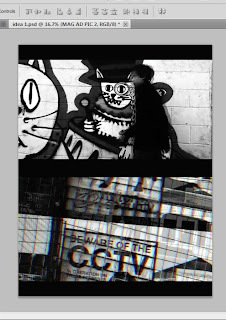 I then used the 'layer mask' and 'gradient tool' on Photoshop to try to better blend the pictures together, in particular the "Beware of the CCTV" image, as we received feedback that the edges of this image were too defined. 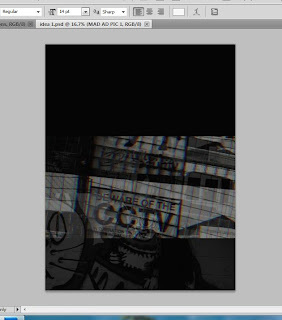 A problem I came across when doing this was the fact that when trying to blend the middle of the image to the background, the CCTV sign became harder to make out, so I focused on the sides of the image, so that you can still read the sign, but the edges aren't as noticeable. I also tried changing the fonts, but after trying various different ideas, I changed them back to my original fonts of; 'charlemagne standard' for the writing at the top of the ad, and 'myriad pro' for the social networking URLs. The editing was more fast paced than before which meant that we had to cut 10 mins of solid footage into around 34 seconds. The pace was very fast which meant that we had some issues with the amount of footage recorded but obviously with more footage we can afford to do some longer takes. 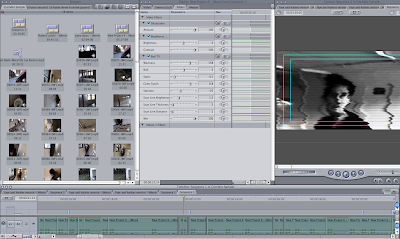 The screen of final cut (left) is a neat example of how we created the video footage effect, combined with total desaturation. Also notice the frame around the footage which we dragged out to tighten the framing on some shots where the framing would detract form the image. Overall to get the 34 seconds- the editing must have taken around 7 hours overall to generate the desired effect. Of course to create the sample footage we exaggerated the special effects somewhat so that the more FX side of the video is on display, in the final video we expect the effects to come in somewhat more gradually rather than seemingly random. 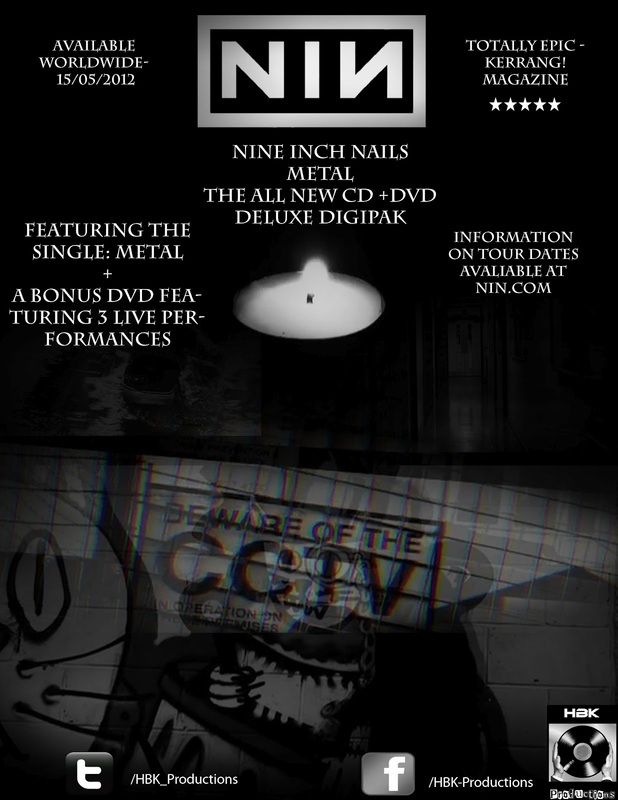 I plan on using a lot of the features of this digipak in our group's Nine Inch Nails digipak, such as; the band logo, the record company logo and details such as what singles are included and the bonus DVD. 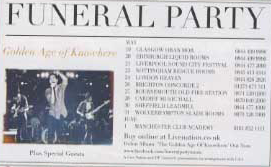 Something that doesn't feature in this magazine advert, but does often appear in others (and something we plan on including) is a number of tour dates on the advert. 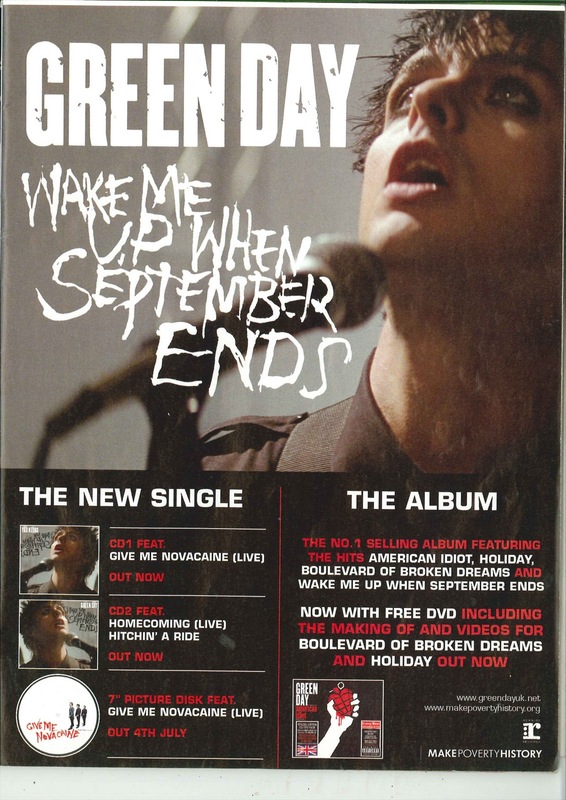 These Adverts all came from Q magazine, although they are all adverts for tours, the bands and song writers are aiming at the same target audience and techniques to capture the target audiences are going to be used. 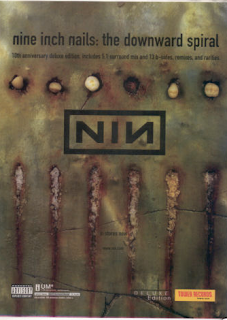 Q is a magazine that could include Nine Inch Nails, as they often feature a large variety of Rock/ Metal bands. 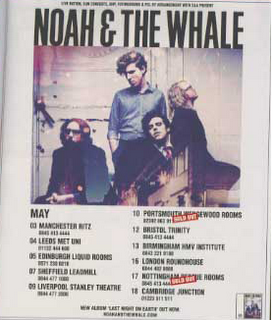 This is an advert for the band Noah And The whale. I instantly notice that the writing is black while the background is white, highlighting the contrast between the two which makes the writing stand out more and become more eye catching. The photograph itself is an artistic old fashioned photograph of the band looking deep and thoughtful, the photograph film is the same colour film that they used in the the 1960s, this is the time where great legendary bands such as the Rolling Stones and the Beatles were introduced so the film type has been used to reflect on these legendary bands and imply that this band is also this great. There are tabs of red on the poster which your eye is very quickly drawn to. This advertisement is much more basic and less eye catching apart from the giant Funeral Party sign. A lot of this advertisement is devoted to the name of the band, this is because when a fan of this band is looking through the magazine the band want to do everything in their power to grab the fans attention and to let him know about the bands activity. I really like this style, its simple and eye catching and does not overwhelm the viewer. Like the rest of the band advertisements, this Villagers ad features large font for the name of the band and contrasti ng colours laid on top of each other to catch the readers attention, this contrast of colours is something we plan to use in our NIN magazine advert, using black and white. 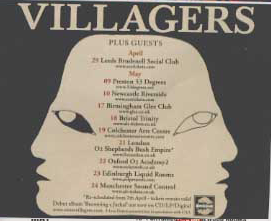 The picture in the background is the logo of the band so if the fan does not get drawn to the giant “Villagers” letters they will get drawn to the logo. This can be very useful tip when creating our advertisement, if I make the screenshot from our video that we plan to use in the ad large as well as having large lettering for the Nine Inch Nails logo then at least one of them will be eye catching and draw in a viewer. The picture also has to be interesting to draw in the members of the public who are not already fans, like this one. 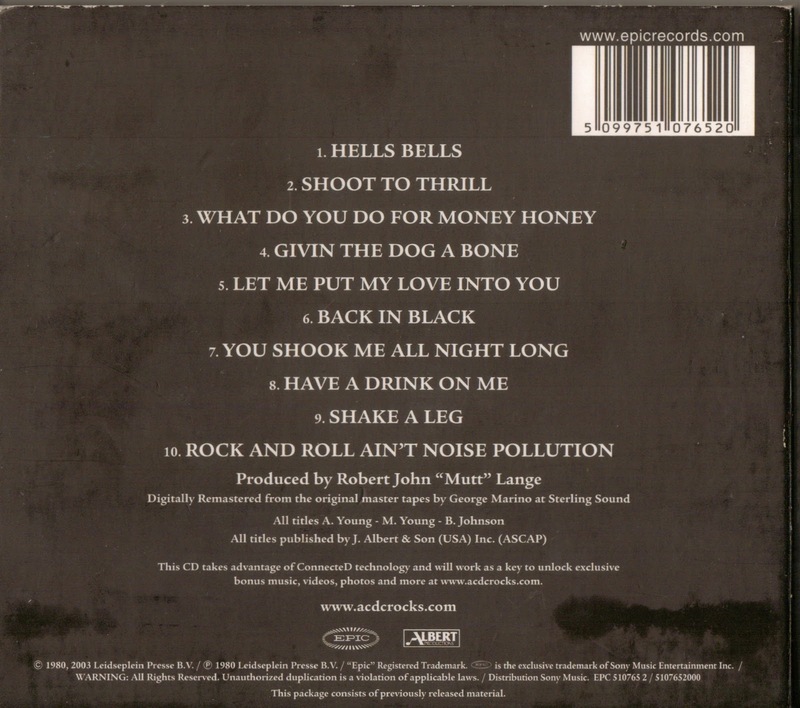 This is the front cover of the digipak for the classic metal band AC/DC. It is good to look at more genre specific examples to see if there is any codes and conventions that the follow. The front cover is quite simple, no photo but just a brown/grey textured back ground no real use of colour. 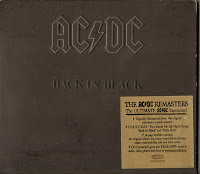 It is clear who the album is by and that the artist is AC/DC as it has the band logo taking most of the focus in a large font at the top of the cover. It isn't a very glamorous or glossy cover at all, no use of colours or bright images that are usually on digipaks to attract people to the CD and make it eye catching in shops. 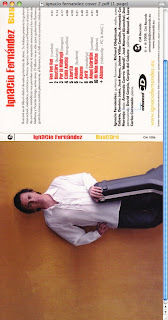 There is a very large sticker which takes up almost a quarter of the front cover, this says information about what is inside the digipak like what singles it includes and how it has been digitally remastered. The inside of the digipak on the inner let panel has photo's of all four band members with the names of them in the photo's these photos have been shot or edited into a colour effect that fits the colour theme of the digipak. On the right panel is the CD which is similar to the front cover and has the same sort of texture effect on it. Is pretty much the same as the back, it has the same brown texture, no colour or images. On the back is the list of tracks in the album. 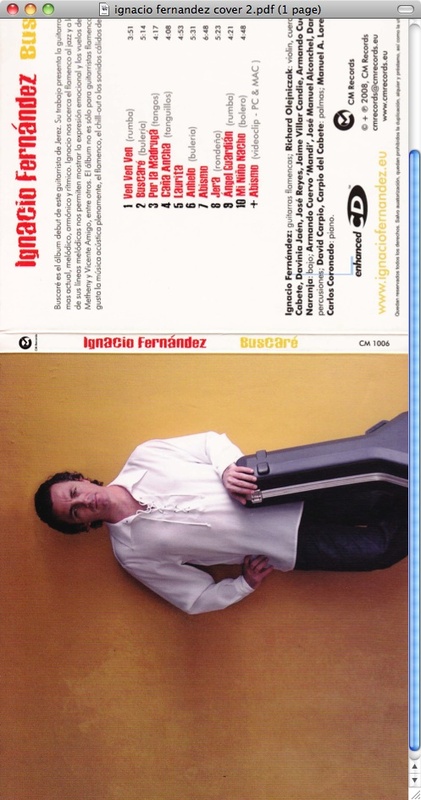 Below this is copyright information, information and credits about who digitally remastered the CD. The adress for AC/DC's website. 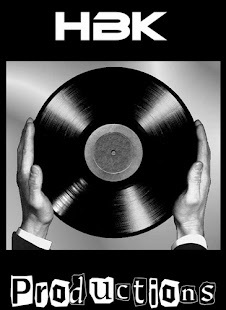 There are two logos of the record company and the production company. A scannable bar code is located in the top right for sales purposes. One director who heavily influences Nine Inch Nails videos, as well as actually directing one of their videos - "Only". 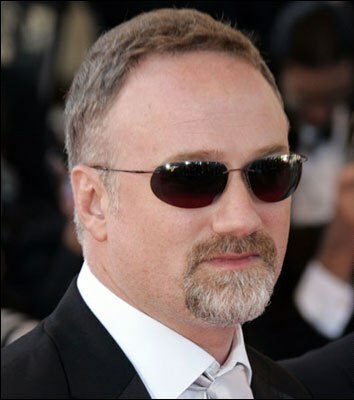 Fincher has directed such films as; Fight Club, Se7en, Panic Room and The Social Network, and has been nominated for 2 Oscars. 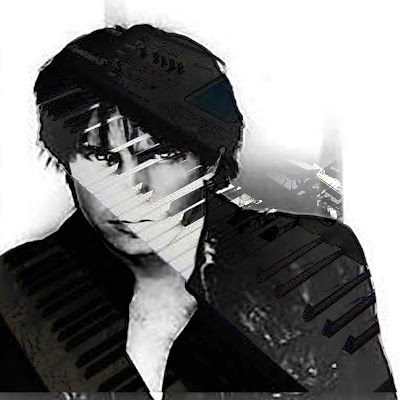 He recently collaborated with Nine Inch Nails vocalist Trent Reznor, on the film "The Girl With The Dragon Tatoo", the second film based on the books by Stieg Larsson, on which Reznor created the soundtrack which included a cover of Led Zeppelin's "Immigrant song". Another thing Fincher is well known for is directing many of Madonna's music videos, such as "Express Yourself", "Vogue" and "Oh Father". He has also directed music videos for artists such as; Sting, George Michael, Paula Abdul, and Aerosmith. The third digipak i looked at was by Bryan Adams, this was a quite obscure one. The cover photo is a piece of metal that has the album name stamped into it, the text doesn't line up and is pretty sketchy giving a cross a more thrashy/low budget look to the album. Other than this the only other thing on the cover is the name of the artist in a black font that stands out against the silver background image. The spine is simple with just serial number, album and artist name. In a simple black font. 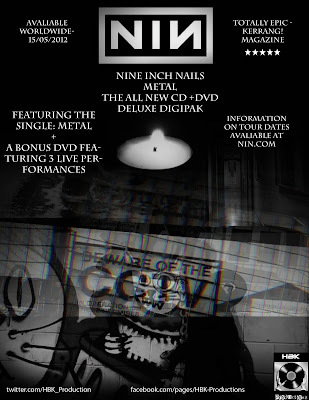 The back of the digipak has an background image that is a picture of a hand with a ring on and on the ring says '18 Till I Die' so it now becomes apparrent what the image on the front cover was. 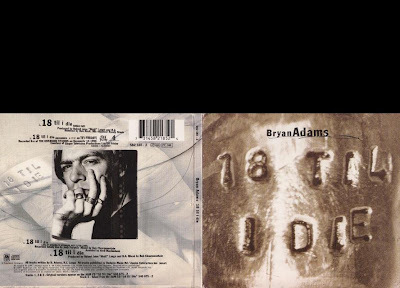 There is a close upphoto of Bryan Adams slap bang in the middle of the back cover and above this has information on where the tracks on the cd were recorded with the 18 Till I Die always in a larger font. There is of course a bar code this is placed in the top right which is different to most as they are usually located in a bottom corner. 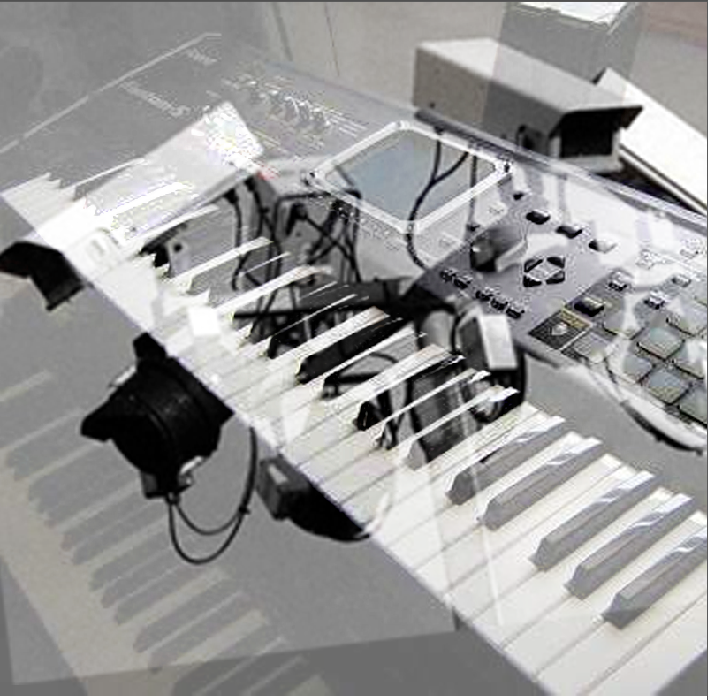 There are production company logo's and also copyright information about the CD. 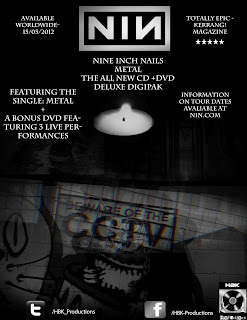 This blog shows the processes of our group, creating a music video for the song "Nine Inch Nails - Metal"